It’s a Friday night in the Seaport, and everyone is celebrating. The couple celebrating fifty years together making their way to Menton for an 8PM reservation. The group in from the suburbs popping into Blue Dragon to see how it compares to its sister, Blue Ginger, in Wellesley. The awkwardly cute beginning of a newly-matched pair outside Committee before they embark on a first date. Restaurants seem to come and go elsewhere in the city, but the industry in this neck of the woods is exploding with new openings and the announcement of more on the way. There are four restaurant seats for every home in the neighborhood, says the Boston Globe—but not for long. From just about anywhere in the neighborhood, you’ll notice more than a few cranes helping to create more than 5,300 units of housing over the next several years. 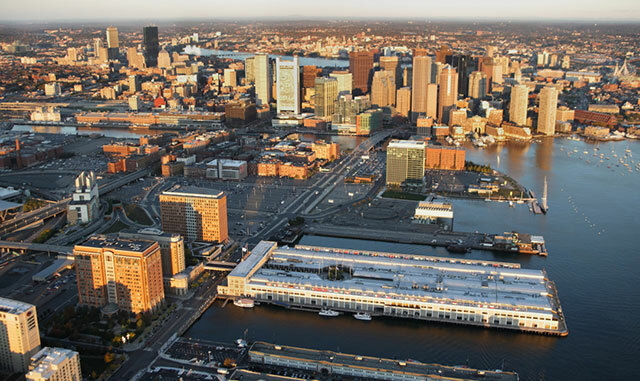 In turn, this will bring the ratio on par with the likes of Boston’s more established food havens like the South End—and with it, longer waits for a seat at your favorite, trendy table on the harbor. However, all this construction has also brought a new guard of go-to dining destinations for all of life’s celebrations. While there is nothing more charming than a spot in some of the storied, small hotspots of older enclaves like the Back Bay, the latest openings in Fort Point and the Seaport offer just as much of an innovative dining room as they do a menu. Along Northern Avenue, a restaurant group is committing a record $8 million to bring Scorpion Bar to the Seaport—an opulent take on Mexican-inspired cuisine and certain to be a new Seaport landmark. Around the corner, the French fare of Bastille Kitchen is only a part of the experience in this venue marked by grand staircases, dark woods, and even a downstairs bar and lounge—the Chalet. As the venue has evolved, it has become as much of a place to bring one’s family after graduation as it is a place to show off a new paramour. It wasn’t long ago that you could just stroll into any of the new places in the neighborhood and get a table. Now it’s becoming more of a case of needing to know and book on Monday where you want dinner on Friday, or you might be waiting until midnight for your first course. It might be a hassle, but it will only take one, delectable bite from one of our many great places for you to be seduced and know it was all worth it.